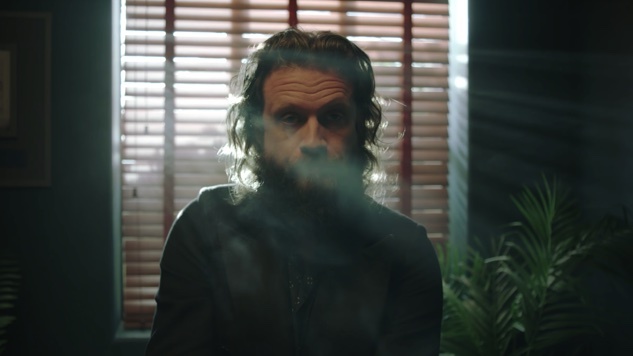 Father John Misty (given name: Josh Tillman) has shared the first music video for a song from his forthcoming fourth album, God’s Favorite Customer, due out on June 1. The “Mr. Tillman” visual, co-directed by Jeff Desom (Health, Hauskcha) and Carlos Lopez Estrada (Clipping, Blindspotting), is essentially The Tillman Show, with Misty as its Truman Burbank. The musician checks into an eerie hotel (the Mint Hotel in Las Vegas, Nev., to be precise), only to realize that he’s trapped in a loop and can’t check out, with bystanders and TV cameras watching him all the while. We half-expected the video to end on a slow zoom to a picture hanging on the hotel wall, depicting a smiling Tillman surrounded by a crowd of well-dressed revelers, and a sinister voiceover insisting that the musician has always been here. God’s Favorite Customer is now available for preorder via Misty’s official store, Sub Pop, Bella Union and select indie retailers. The album follows Misty’s opus Pure Comedy, which Paste numbered among 2017’s best albums. Watch Misty’s “Mr. Tillman” video and listen to his 2012 Daytrotter Session below.